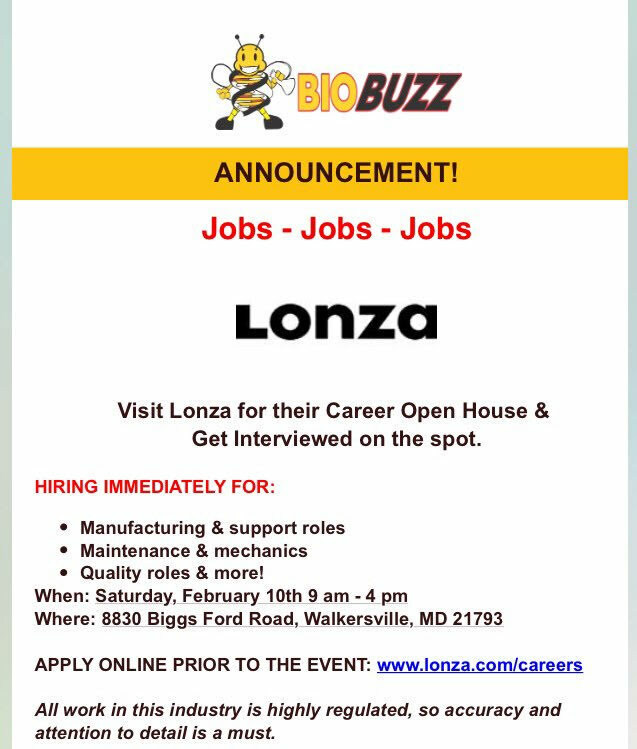 Lonza, one of the largest employers in Walkersville, will be holding a Career Open House this Saturday, February 10, 2018. Interested employees are invited to visit Lonza at 8830 Biggs Ford Road in Walkersville between 9 a.m. and 4 p.m. Applicants will be interviewed on the spot. Lonza currently lists 49 open full-time positions at the Walkersville location on their web site. Jobs available include manufacturing, maintenance, mechanics, quality roles, scientific, and more. Interested individuals should apply online before attending at http://www.lonza.com/careers.